President Lincoln appointed five Justices to the United States Supreme Court during a critical period in American history. When he assumed the presidency in 1861 the Court had only one vacancy. However, Justice McLean soon died and Justice Campbell resigned to join the Southern Confederacy. Lincoln did not fill any positions until 1862, when he nominated Noah Swayne, Samuel Miller, and David Davis. In 1863 Stephen Field became the tenth Justice after Congress expanded the Court. When Chief Justice Roger Taney died in 1864, Lincoln appointed his former Treasury Secretary to succeed him. During this period Justices received an annual salary of $6,000 and were expected to travel the circuit to hear federal cases. They met for only one term a year in the U.S. Capitol. 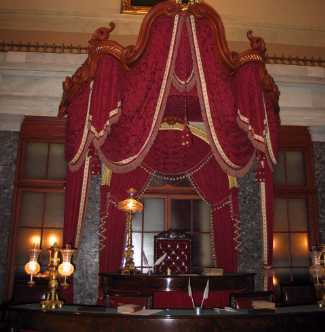 The chamber pictured is the one the Court occupied in the U.S. Capitol building during the Civil War. Abraham, Henry J. Justices and Presidents. New York: Oxford University Press, 1992. Friedman, Leon and Fred L. Israel, editors. The Justices of the United States Supreme Court: Their Lives and Major Opinions. New York: Chelsea House Publishers. King, Willard. Lincoln's Manager, David Davis. Cambridge, Mass. : Harvard University Press, 1960. Silver, David M. Lincoln's Supreme Court. Urbana: University of Illinois, 1956. Simon, James F. Lincoln and Chief Justice Taney: Slavery, Secession, and the President's War Powers. Simon & Schuster, 2006.